This summer (is it really summer already?!) I am participating in a fun even called Read Around the World. Throughout the summer bloggers from all corners of the world will be sharing their favorite children’s books. If you want to know more about the series check out our Pinterest board and the Multicultural Kids Blog Facebook page. 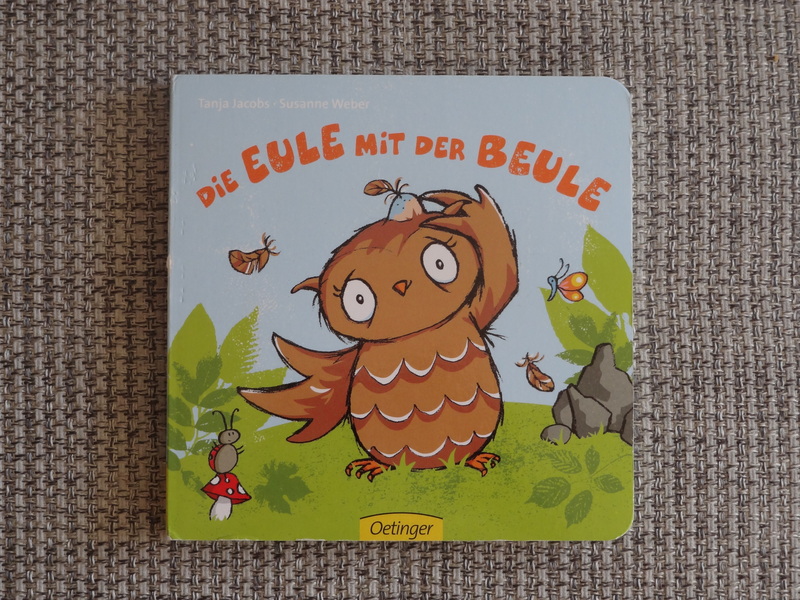 I would like to tell you about a wonderful little book for the smallest ones: Die Eule mit der Beule – in English, the owl with the bump – published by Oetinger. I chose this book for two reasons: first, it came to us through a wonderful initiative called Buchstart (read more at the bottom of the post). Second, and much more importantly, it is one of the few books that can be read from cover to cover with our very active one-year-old. This book tells the story a little owl who has bumped her head and the animals who try to console her. The snake strokes her cheek, the fox blows on the bump, the little mouse wants to put a bandage on it, while the bear offers to cover the bump with some honey. Finally mama owl comes to rescue and gives the little owl a hug and a kiss, making it all better. This book is recommended for ages 18 months plus but, in my experience, it is plenty of fun already for a one year old. The illustrations are very cute, and the thick pages are easy for the little one to turn by herself. What makes the story especially great for a toddler is that each of the pages can not only be looked at and read aloud but also acted out, for example, by stroking their cheek or giving them a big hug. Needless to say, this sweet little book works particularly well for a child who has gotten a bump or a bruise! Buchstart is a great project in Hamburg, as well as some other cities, that aims to promote early childhood literacy by encouraging parents to read to their children from an early age to instill in them a love for books. As part of the project, at the mandatory health checkup that takes place around the first birthday each child receives a bag with a few books and information materials, e.g., about signing up at the local library and free playgroups. I will look for this book in my next trip to the library!